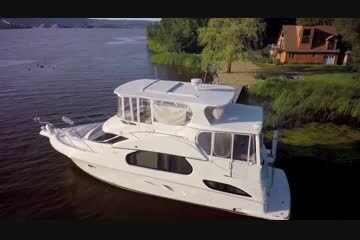 FRESHWATER yacht with only has 350 hours on the Yanmar Diesel engines. Bow & Stern Thrusters. There is a custom hardtop with a sunroof. The electronics were upgraded in 2015. All new bridge canvas in 2014. This boat also has a custom winter cover! Joel Dionne Yachts is pleased to assist you in the purchase of this vessel. This boat is centrally listed by Barker's Island Marina. Elegance and spaciousness are what the Silverton 43 Motor Yacht is all about. A sleeker, lower exterior design reduces windage and enhances performance while still incorporating the trademark Silverton SideWalk. These molded steps provide quick and safe passage to the foredeck and allow the salon to reach full-width from gunnel to gunnel. An enlarged flybridge includes an expertly laid out helm with all the latest in electronics, plus a large seating area with loads of storage. Entertaining or relaxing is easy on the covered aft deck which comes complete with wet bar. Beautifully crafted cherry wood is in abundance throughout the well thought-out interior. A grand salon features a large and comfortable settee while the equally large dinette provides additional seating and storage. A standard 27-inch television is strategically located up above for all to view. The surround sound stereo makes movie night a theater experience. The expansive, Corian-covered galley is complete with top-of-the-line appliances. The pullout pantry has plenty of storage. Both staterooms enjoy queen-size, innerspring mattresses and a multitude of storage and hanging lockers. The split head and shower arrangement both fore and aft allow for great flexibility for the owners and guests. The Yanmar diesels provides performance and economy.